Twilio makes it easy for developers to send and receive text messages and make and receive phone calls to build apps that communicate. They ditch the complexity of black box communications hardware and expose a globally available cloud API that developers can interact with to build smart, scalable and fun communications systems. Basically, it allows you to write code that interacts with mobile phones, SMS, and landlines. Companies like Ebay, Hulu, Airbnb, Groupme and many more use the Twilio API as a way to embed telephone communications directly into their product. In this class, Rob Spectre (Director of Developer Evangelism), alongside Christopher Castiglione, develop an app that hooks into the Twilio API. They’ll build something every successful startup needs! What’s that you ask? A customer support line to manage all those support calls you’ll be getting. Have some fun with the waiting experience. (Because it’s your startup, and while your customers are on hold they shouldn’t be forced to listen to easy-listening Muzak. Unless you want to be ironic, then sure, we get it). Twilio Account - Register for a free Twilio sandbox account prior to watching the livestream: http://www.twilio.com. 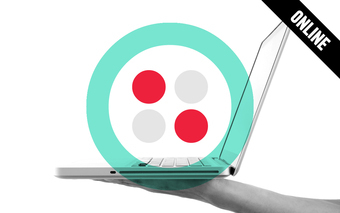 You’re following Dialing into the Twilio API (Livestream from NYC).